It has been a little over a month since we got the Frontier and posted our initial review. I’ve had so many requests for additional photos and measurements, I wanted to give the update its own post. This is quite picture heavy, so I apologize in advance if you are on dial-up connection. Post #1 – When we first got the Frontier with comparison pix next to the Marathon. > Post #2 – This post answers some visitor questions with photos of my oldest 10 yo daughter in the seat. So far we really like the Britax Frontier car seat. It is fairly easy to install using the long belt path (LBP) and easy to get a rock solid install at that. It doesn’t budge an inch after we get in the car. My daughter has had snacks, dirty shoes, etc. and I’ve been able to wipe the seat clean with a baby wipe. It says the cover is machine washable, but I haven’t done so yet. I was afraid that the flimsy (to me) cup holders wouldn’t stay closed during my initial assessment but I don’t have a problem with that. The install seems to put appropriate pressure on them to keep them closed. I haven’t opened them at all because we simply don’t have room to use them in our car. Rachel, especially, likes riding in it. She likes the independence she now has in getting in and out of her own seat. She has commented that it is comfy. She’s fallen asleep many times in the seat. In the Marathon when she’d fall asleep, her head would just lay back and fall gently to one side or the other due to the slightly reclining nature of the seat. Because the Frontier is more straight-backed, her head does occasionally roll forward. But really not much to be a problem. Overall, the Britax Frontier is a good value for the money. It’s expensive, yes, but now seeing how our 10 year old (!) daughter fits in it, I know this is money well spent. We’ll be able to use this car seat for a long time and get much use out of it. And that’s better than buying a cheap car seat that won’t last as long as the need will. First some answers to questions that I have received. These are answered to the best of my ability. I am just a mom, not a safety tech expert. So take my info for what it is worth and if in doubt, I highly encourage you to visit a local USA safety tech and/or the car seat safety forum. There are many many more people there more experienced than I am. The 1st 5 questions are from Trish of New Zealand. The 6th is from Corinne. 1. With the seat installed, can you tell me the measurement of the seat from the back of the vehicle seat to the edge of the seat? From the car’s back of the seat to the front of the Frontier car seat it measures 20 inches. My car’s bench seat measures normally at 20.25 inches, so the car’s seat extends a quarter of an inch beyond the Frontier. 2. If you uninstall it, or have it installed using the long belt path, can you tell me, using a flexible tape measure, how long the seat belt is from edge to edge of the seat? We use the long belt path. 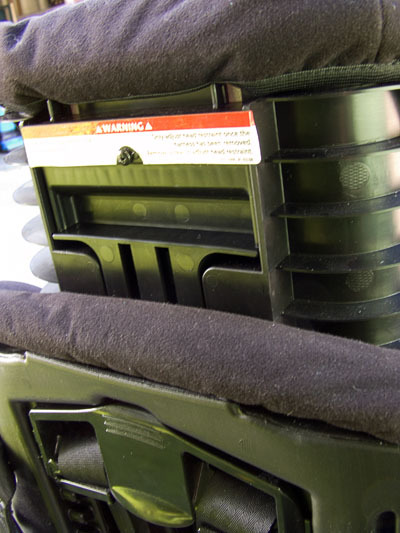 Our seat belt is such that it run from the side of the car up 8″ through a slot anchored towards the roof of the car, then down to the seat/person. From the anchored slot to the hole in the car seat it is 23″. 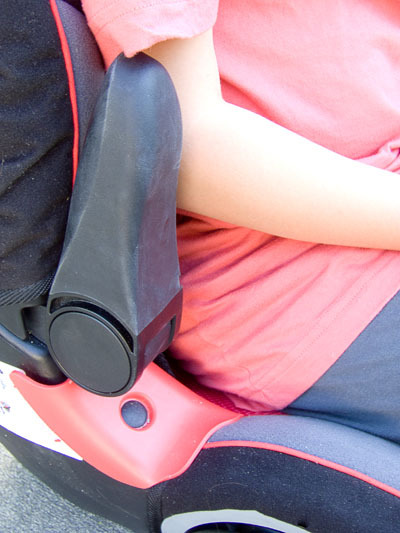 Add another 15″ from car seat slot to car seat slot. 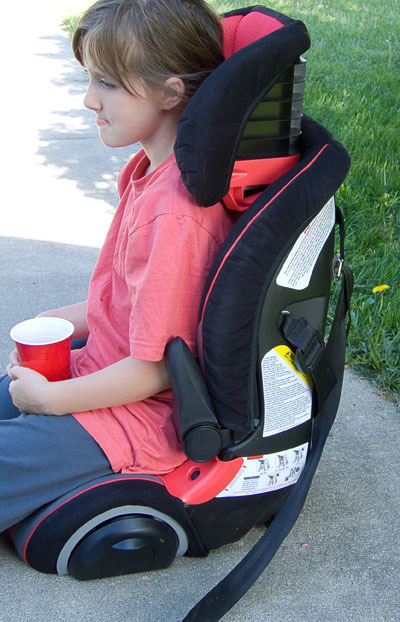 From the car seat slot to the hookup is 8.5″. (I don’t know all the names for the seat belt parts!! LOL) Total seat belt length is approx. 54″ (give or take an inch). 3. Also this is a long shot, but do you know how high up the seat goes in booster mode? Does your eldest daughter fit in the seat with the harness or in booster mode even? As you can see from the pictures, my oldest daughter does fit in the car seat but only without the harness straps. With the head rest pulled up as high as it can go, I measure from the inside base of the seat to the top harness strap slot about 17.5 inches. I hope I’ve answered this question adequately. 4. Is the seat easy to use and maneuver? How do you personally compare it to the MA? It is pretty easy to maneuver and use, especially with the additional pdf instructions. It is lighter than the Marathon and not as bulky. (But I asked hubby for his opinion and he thinks they are about the same. :dunno: ) All I know is that I was trying to move both car seats off of the driveway and I was carrying a baby in one arm. So being one-handed, I found the Frontier a tad easier to move about than the Marathon. But honestly, both are heavy seats, which personally I prefer heavy sturdy seats. But I’ve lugged the Marathon through airports and it wasn’t fun. I wouldn’t want to think about struggling with the Frontier either. 5. Can you please tell me how high the head rest is from harness slot to top of the head rest? 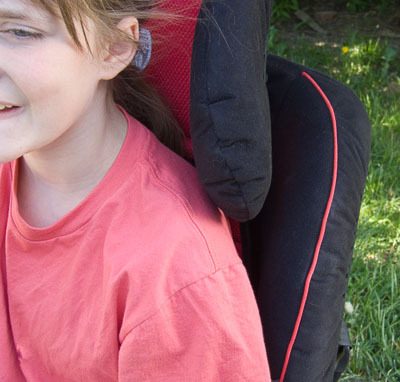 With the head rest pulled up as in the picture below, it measures about 10.5 inches. For the most part. I found when we have them up, they don’t fall down on their own. I took a picture of the arm rests up below. Here are some measurements of my tween so you can get an idea of how the Frontier fits her. torso: (approx.) 21.25 inches –> I had measured her sitting with a straight back from the floor to the base of her neck. As you can see in the first photo, my 10 year old daughter *does* fit in the Frontier. Would I put her in it? Probably not. I’d go backless booster for her. 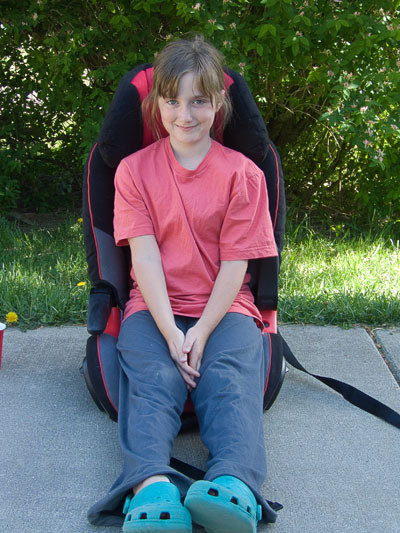 Now, her friend who is 10 years old weighs only 70 pounds and is 3 inches shorter would fit just fine in this car seat. Here you can see her head above the head rest by about 1 inch. Honestly, I don’t know if the head rest can go any higher in booster seat mode. My husband read the manual directions, but we couldn’t figure out if it did or not. There is a screw in the back, and once you remove the harness straps, you remove the screws and adjust the head rest. Since hubby didn’t remove the straps (he didn’t want to have to go through the hassle of rethreading them just so I could take photos – sheesh! men! LOL), we never figured out how much the head rest adjusts after that. Perhaps I’ll make an attempt myself in a week or two. Although the wings of the head rest are narrow, my daughter’s head fits with a bit of room on either side. The only bit of concern is that the bottom of the wings touch her shoulders but just barely. Haven’t researched this yet to see if this is a big deal safety-wise. My daughter is tall for her age and I don’t foresee having any fit problems since my youngest daughter tends to be on the short side. 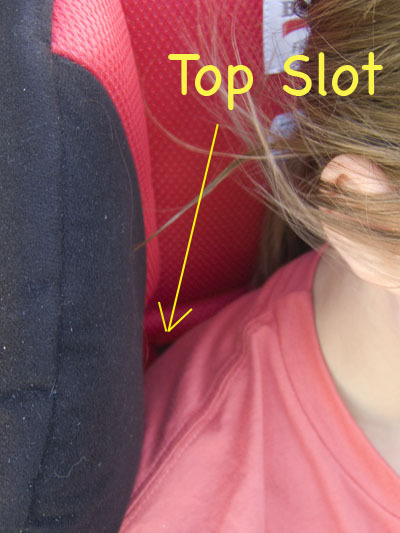 As you can see, the top slot falls below my daughter’s shoulder by about an inch or two. The arm rest swings up and out of the way. It doesn’t fall down on its own. It does become a major source of back seat tension with one kid wanting it up (my youngest who is in the car seat) and the other who wants it down (the oldest who wants to use it as an arm rest for herself). But if it wasn’t the arm rest, it would be something else! It is black. Photo shows green reflection from the grass and tree. Right below the word “Warning” on the white sticker, you can see the screw I was mentioning above. But from the top of the main portion of the seat to the top of the head rest as it is in the photo, it measures 7.25 inches. I apologize for the delay of these photos for some of ya’ll. I hope this helps with your buying decision! If you on the edge about buying this seat, be sure to purchase the return insurance for just a few bucks from Elite Car Seats. And no… I don’t get paid by them. I have bought both my car seats from them and they have always treated me well. I just like promoting businesses who have good customer service. Can I ask for a photo of the underside of the seat? Would it be bad if it overhangs my seat edge by 2 inch? 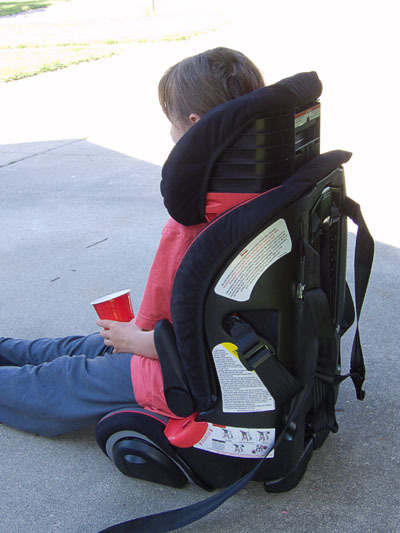 Does it REALLY have to be used with the recline block forward when used in car seat mode? or “could” it be used in the full upright position? When in recline, does it really slope much? Could you take a side on, against something flat, photo of the MA next to the Frontier? My MA slopes a lot. Oh this is a silly one, my niece’s torso is 14.9inch, she would be on slot 4 or 5, how high is the head rest on slot 4, 5, 6, 7, 8? I cannot believe how far carseats have come since my boys were little. Safer, easier to use. I totally agree about spending money on a good one, once, instead a series of cheap ones! I just found out that my husband never had a car seat as a child! Can you imagine? He said that it wasn’t mandatory when he was a kid. At one point, his parents purchased a pick up truck that didn’t have any rear seats. My husband and his brother rode in the back of the pick up truck all the time. Josh said that the one time that he remembered someone saying something about it to his parents was at a stoplight during torrential downpours. His parents were snug as bugs in the cab of the truck (smoking cigarettes, of course) while Josh and his brother were getting beaten with rain in the back of the truck. A guy rolled down his window after pulling up at the stoplight beside them and called Josh’s parents all kinds of names for leaving their children out like that. Josh said he was probably six or seven and his brother was younger than that. You are allowed to like the blue paint better! My entire house was that particular shade of blue. The lady who lived here before us loved powder blue and pepto bismol pink. She painted the dining room pink and every other room in the house powder blue. I like powder blue and will probably paint the kid’s room that shade although not with flat paint because kids and flat paint do not mix. I’ll get the washable paint, I think. I want to see a picture of your purple kitchen!! That is just too cool!